Bacon, Cheese, Eggs on pizza? What could be better? 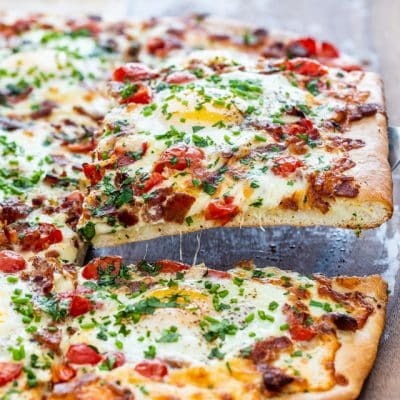 This Breakfast Pizza recipe makes for a great weekend breakfast, it’s simple, delicious and totally homemade. 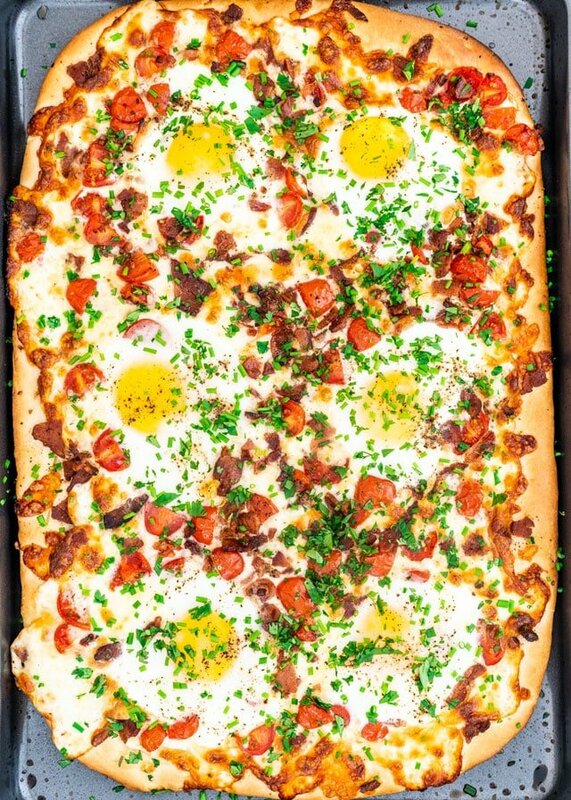 My latest favorite weekend breakfast is a breakfast pizza. I was a bit skeptical at first, you know, eggs on a pizza, that’s got to be strange, right? Not so, it is actually amazing. 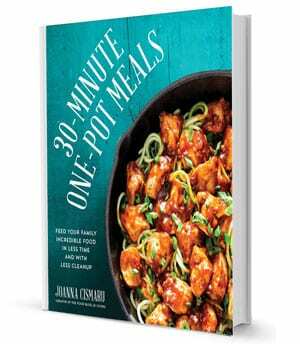 Also it’s very quick to make, especially if you have the pizza dough already made. Picture your ideal plate of breakfast- What’s on it? Mine is loaded with tomatoes, lots of bacon, and a sunny side up egg with the yolk still nice and runny. That’s how I designed this recipe! 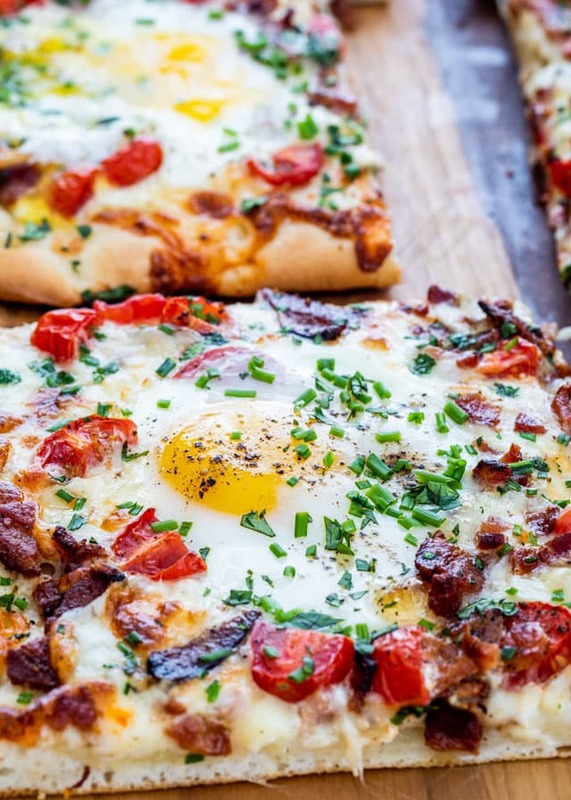 Breakfast pizza can be anything you want it to be. These toppings happen to be my favorite, and trust me when I say they’re over-the-top delicious. For this recipe, I used my homemade pizza dough. I’ve been making my own pizza dough now for years and I’ve never looked back! This dough also freezes so well. Take it out of the freezer 6 hours before you plan on using it, and it will thaw out perfectly. Roll the dough to a rough rectangular shape, and lay it onto an oiled cookie sheet. Use your hands to spread it out as much as you can. Now it’s time for the toppings! You’ll notice there’s no sauce used for this pizza. I promise you won’t miss it with all that cheese and those delicious creamy egg yolks! Start with a thin drizzle of olive oil, then add your cheeses, the tomatoes, bacon, and lastly, the eggs. I created little divots in the pizza toppings to hold the eggs in one place while it bakes away. Bake the pizza as hot as your oven will go. Add fresh herbs and garnish after the pizza is done baking. If you want your eggs cooked with a harder yolk, bake the pizza until the cheese and crust turn golden, then turn off the oven and let the pizza bake for another 5 minutes, or until you’re happy with the doneness of the eggs. 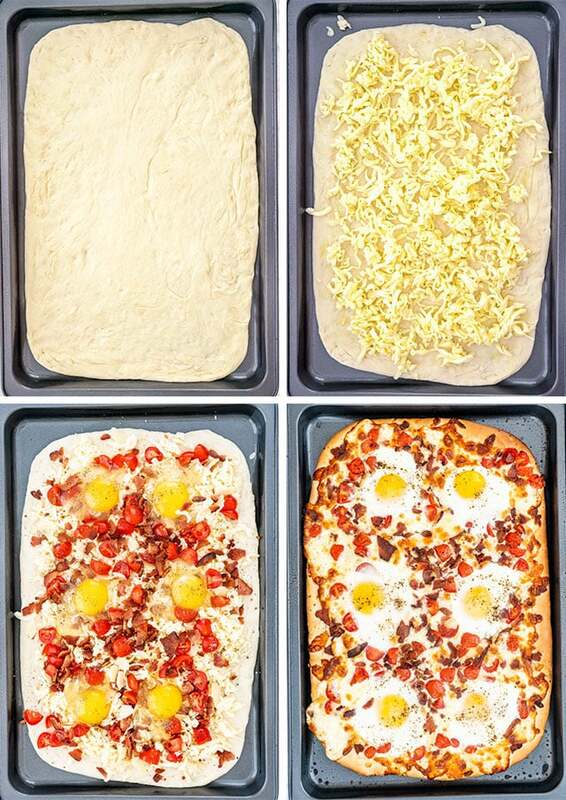 Cut the dough into individual servings to make fun personalized pizzas for guests, or cooking with kids. What Else Can I Put on My Breakfast Pizza? 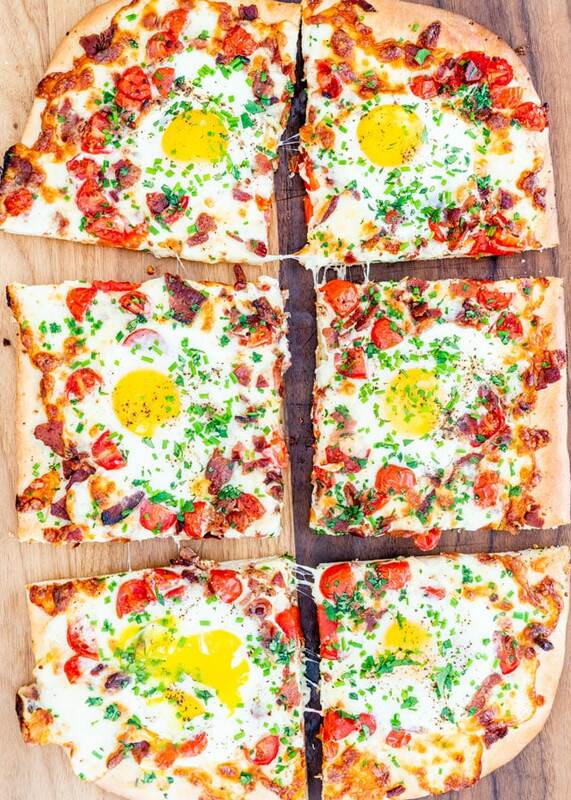 This breakfast pizza recipe is so simple to make and also very versatile! You can really use any ingredients you want- eggs, bacon, mushrooms, tomatoes, peppers, sausage, caramelized onion, the list goes on and on. The pizza I made is pretty basic! What else screams breakfast more than bacon and eggs? In my opinion, what really takes this from a regular pizza to a breakfast pizza is that egg atop each piece. That’s one ingredient I wouldn’t change if you decide to reinterpret the recipe! Love This Breakfast Recipe? Try These! Bacon, Cheese, Eggs on pizza? What could be better? 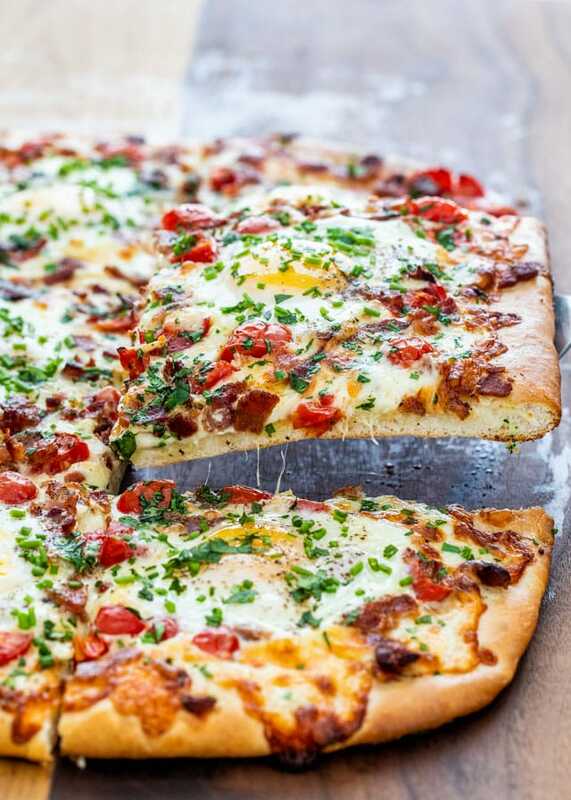 This Breakfast Pizza makes for a great weekend breakfast, it's simple, delicious and totally homemade. Spray a baking sheet (15.25 x 10.25 inches) with cooking spray. Roll out the pizza dough and place it on the pizza baking dish. Drizzle the dough with a bit of olive oil. Arrange the mozzarella cheese evenly over the dough. Sprinkle with Parmesan cheese. Top with bacon and tomato. Crack 6 eggs on the pizza. Bake for 10 to 15 minutes or until the edge is golden brown. This and all the breakfast recipes sound so awesome e and I will be trying soon. 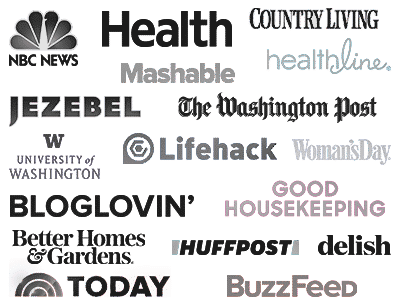 You have the Best recipes and tips and I’m so glad and grateful to have found you!!!!! Aw thank you so much Kathleen, you’ve made my day! This looks really good! Bacon and eggs is one route I haven’t taken my pizza yet, but I’ll have to change that.